Not to be confused with World 6-4. Area 6-4 is the fourth course of Cosmic Adventure and the forty-ninth course overall in Mario vs. Donkey Kong: Mini-Land Mayhem!. The level features a Mini Mario, a Mini Toad, a Mini Peach, and a Mini Donkey Kong, though not exactly in the same starting positions. The Mini Mario begins at the bottom right, the Mini Toad begins at the very center, and the Mini Peach and Mini Donkey Kong begin on the left, with most of the exit doors situated in the tog right corner. In order to reach them, they must simply be guided via a series of Blockers and Red Girders to it. The M-Token is located at the bottom center, directly below the Mini Peach door. To collect it, the Mini Mario must simply follow the first Red Girder from their starting position. 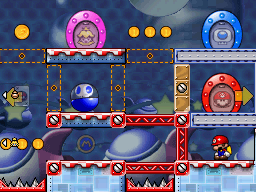 The Mini Mario Card is located on the bottom center, atop a Red Girder platform on the middle level. Once the Mini Mario frees the Mini Peach, one of them must turn around and follow a Red Girder ramp to it. In order to earn a trophy, the player must score 14500 points. In Plus Mode, the Mini Mario must be guided to the exit door first, followed by the Mini Toad, then the Mini Peach, and finally the Mini Donkey Kong. In order to earn a trophy, the player must score 13900 points.